This paste has a very strong flavor - cloves with a hint of mint. The flavor is so powerful that it lingers in my mouth a full ten minutes after brushing. Interestingly, it seems to be packaged for family use, judging by the smiling family photo on both the tube and box. Dabur Red came in a large box containing a 200 g tube (7.2 oz) and a bonus translucent purple toothbrush - labeled Binaca. Americans will know Bianca as a brand of breath spray. 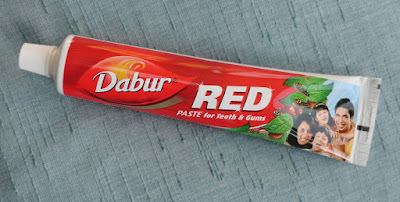 In India, it's a toothpaste brand, manufactured by Dabur, the company that made this red toothpaste. Or I should say Red toothpaste. Our friends that curated a post on Binaca over at Wikipedia also identify Binaca as an undergarment brand that is marketed in India and owned by Kiran Textiles.